I recently wrote an article for MindBodyGreen.com on hot yoga. For years we’ve been hearing about Bikram, Evolation and heated vinyasa. 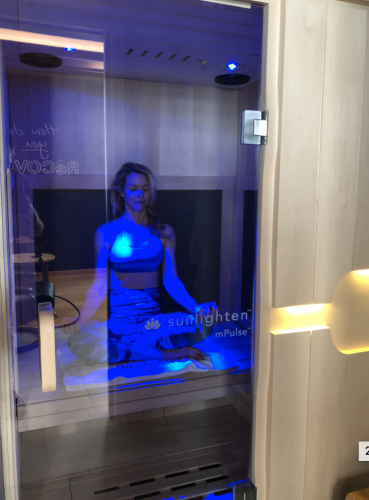 Today, the new hot way to get in your favorite pose is inside an infrared sauna. Recently I discovered the Sunlighten infrared sauna. And that day happened to be 95 degrees! I’m personally not a huge fan of extreme heat or sitting still for an hour. The good news? The sauna uses a gentle heat. I also decided to put my multi-tasking skills to work and do some chair yoga. I was pleasantly surprised by how wonderful I felt after the Sunlighten sauna and how open my body became. But how you might ask can you do yoga inside a sauna? A Texas State University study showed heated yoga helps to burn more body fat than non-heated. 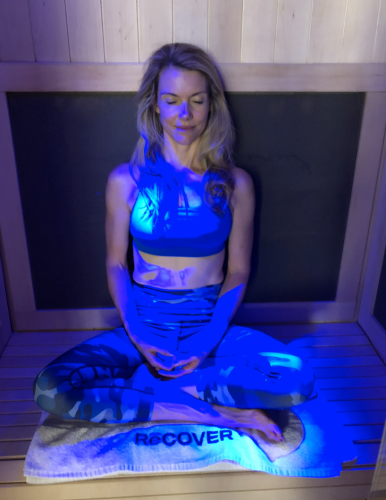 Doing infrared sauna chair yoga can also help with recovery, reduce stress by decreasing cortisol (also known as the “fight or flight” hormone), ease joint pain and stiffness, strengthen the cardiovascular system, relieve muscle pain and increase flexibility. Stretching in the Sunlighten mPulse 3-in-1 infrared sauna while using the Pain Relief program has shown to increase flexibility up to three times. Using infrared sauna therapy post-work-out has its own benefits – from pain reduction to preserving muscle strength. The heat soothes nerve endings and relaxes the muscles. 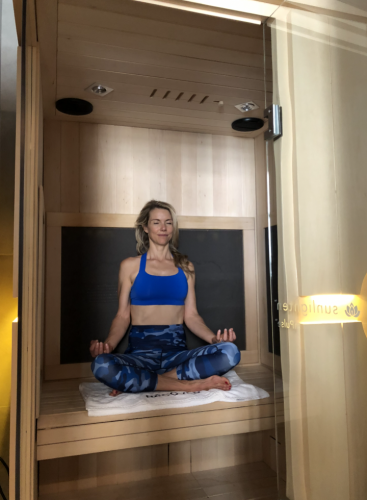 Celebrities, pro-athletes, Olympians, health gurus and doctors are making infrared saunas a core part of their wellness regimen and sharing the health benefits via social media, blogs and with the media. Saunas need to emit high concentrations of infrared waves—not just heat – to release toxins and deliver real health benefits. Emissivity is the ability of an object to emit or absorb energy. Without high emissivity, a sauna may produce heat, but it won’t provide healing infrared. Sunlighten is the only brand on the market with proven emissivity ratings of 95-99%. Because Sunlighten saunas emit a soothing, gentle heat, they can be enjoyed for longer periods of time than other saunas. These long relaxing sessions mean even greater physical and mental health benefits. I was pleasantly surprised by the energy I had for the rest of the day after sitting in a Sunlighten mPulse 3-in-1. I’ve had many clients use the weight loss program. One of my colleagues owns a Sunlighten at her beach house. She uses it regularly and her skin looks amazing. I used the Sunlighten here in NYC at a place called Recover that focuses solely on recovery. I truly loved it and would do chair yoga in one as often as I could. For someone who just wants to zen out and meditate while sitting in the sauna, you can tune into Pandora, enjoy the Acoustic Resonance Therapy, which adds vibrations to the tunes for a deeper relaxation or even catch up on Netflix.